Legion of xXDEATHXx, the alliance with a name reminiscent of a 13 year-old’s console gaming ID, has been evacuating assets to NPC stations for at least two weeks. With RA supposedly cutting a deal to transfer all of their sovereignty to their enemies, the downfall of XIX is likely to come even sooner than anticipated. Recently, AAA has been camping XxDEATHXx evacuation systems, including critical jump beacons across multiple regions. Until today the majority of the kills have been carriers or jump freighters. No one complains about such kills, but they don’t match the bliss of seeing a super-cap explode. However, today was an especially good day for the AAA members who have been actively hunting xXDEATHXx evacuees. -1 Nyx and Rorqual in Malpais on an XxdeathXx tower! 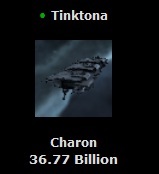 Members of the -A- corporation “hirr” had cloaked tacklers ready when a Rorqual and two super-carriers jumped to a cyno beacon in 6-WMKE. A Hel was allowed to escape, possibly out of sheer pity for the owner, but a Rorqual and Nyx were destroyed by a AAA super-cap fleet consisting of one titan and 22 super-carriers. The future of this once powerful alliance is currently uncertain. Many speculate they may attempt to negotiate with Solar to re-establish their pre-civil-war boundaries, but whether that will be acceptable to Solar is unknown at this time. This entry was posted on March 20, 2012 at 7:59 pm and is filed under Against All Authorities, Killboard Stats. You can follow any responses to this entry through the RSS 2.0 feed. You can leave a response, or trackback from your own site.